The dryness and drought trend standard measure is the the Palmer Drought Severity Index. 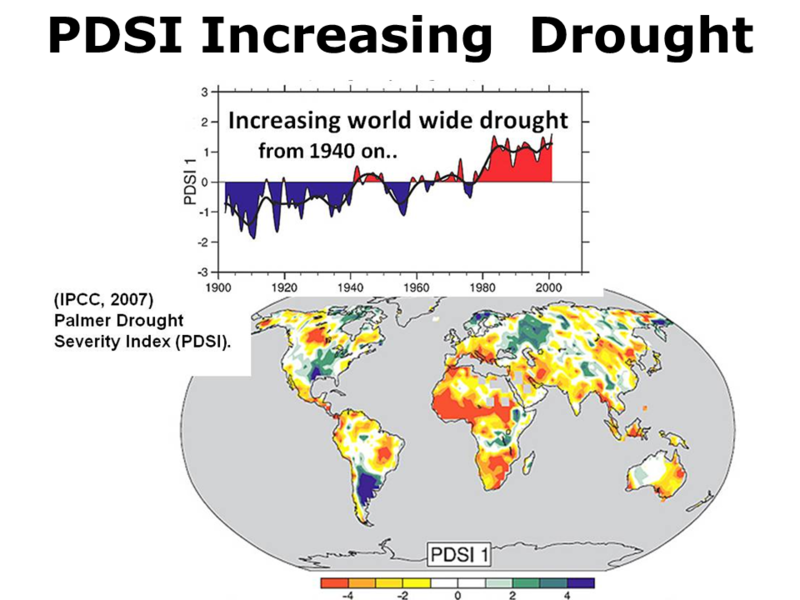 The 'PDSI Increasing Drought' map shows the global PDSI from 1900 to 2002. The IPCC special report on weather extremes (SREX) questions the reliability of past global global drought data, but dry regions are getting drier and wet regions wetter as predicted. 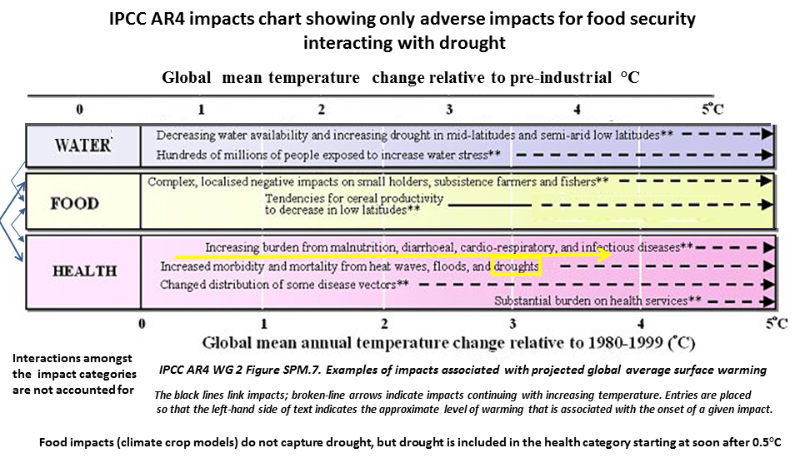 All assessments agree drought will increase with warming. 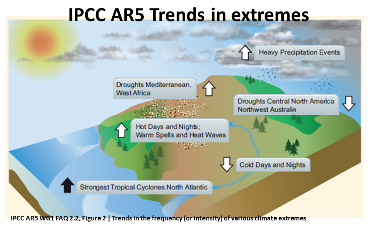 ​Climate change is projected to worsen conditions (high temperatures and drought) in a region already vulnerable to climate variability, and to reduce water availability, hydro power potential, summer tourism and, in general, crop productivity. ​far more ​than ​previous assessments. ​losses by several-fold (Mader, 2003). ​A number of studies in Africa (see Table 5.3) and in Mongolia (Batima, 2003) show a strong relationship between drought and animal death. 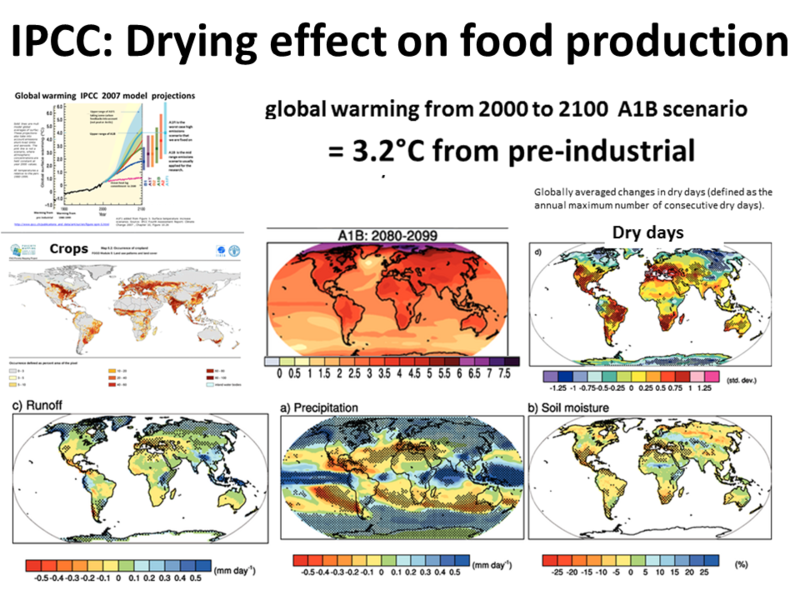 Projected increased temperature, combined with reduced precipitation in some regions (e.g., Southern Africa) would lead to increased loss of domestic herbivores during extreme events in drought-prone areas. With increased heat stress in the future, water requirements for livestock will increase significantly compared with current conditions, so that overgrazing near watering points is likely to expand (Batima et al., 2005). By 2020, between 75 and 250 million of people ​are projected to be exposed to increased water ​ stress due to climate change. By 2020, in some countries, yields from rain-fed ​agriculture could be reduced by up to 50%. 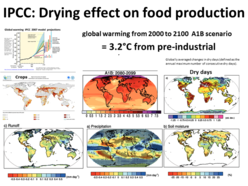 ​​By 2030, production from agriculture and forestry is projected to decline over much of southern and eastern Australia, and over parts of eastern New Zealand, due to increased drought and fire. ​​There is also high confidence that many semi-arid areas (e.g. the Mediterranean Basin, western United States, southern Africa and north-eastern Brazil) will suffer a decrease in water resources due to climate change. Drought-affected areas are projected to increase in extent, with the potential for adverse impacts on multiple sectors, e.g. agriculture, water supply, energy production and health. Regionally, large increases in irrigation water demand as a result of climate changes are projected. to Advance Climate Change Adaptation (SREX) IPCC 2011​. 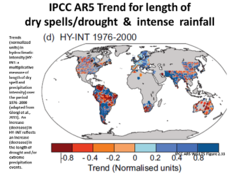 ​​It is more likely than not that human influence has contributed to a global trend towards increases in area affected by drought since the 1970s. ​​​​Some regions of the world have experienced more intense and longer droughts, in particular in southern Europe and West Africa. Droughts will intensify in the 21st century in some seasons and areas, due to reduced precipitation and/or increased evapotranspiration. This applies to regions including southern Europe and the Mediterranean region, central Europe, central North America, Central America and Mexico, northeast Brazil, and southern Africa​.